This salad is perfect for the warm weather. 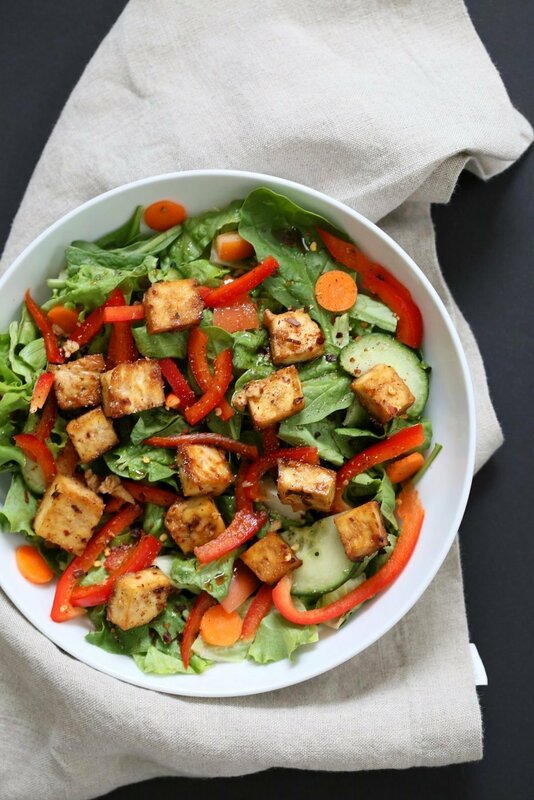 Serve it with warm just baked tofu, or cold prebaked Tofu, plenty of crunchy juicy vegetables and this versatile garlic soy dressing. 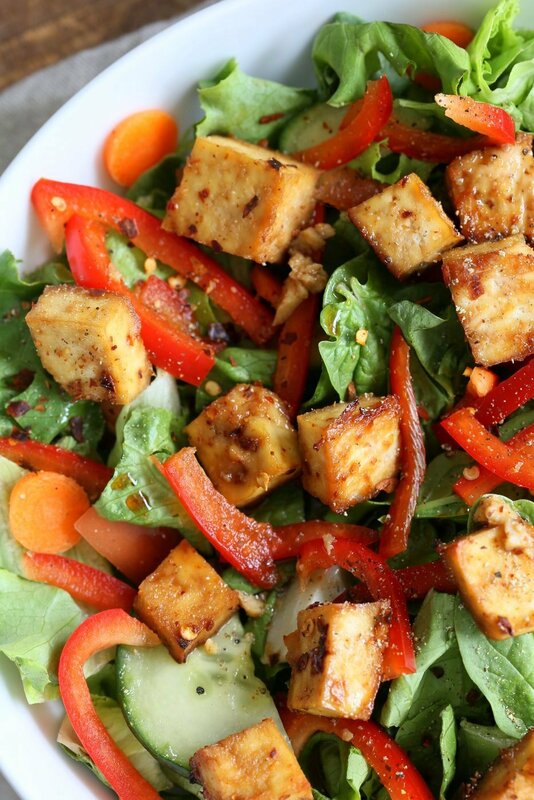 This Baked Tofu is easy and a great topper for Salads. Press, Marinate, bake and done. 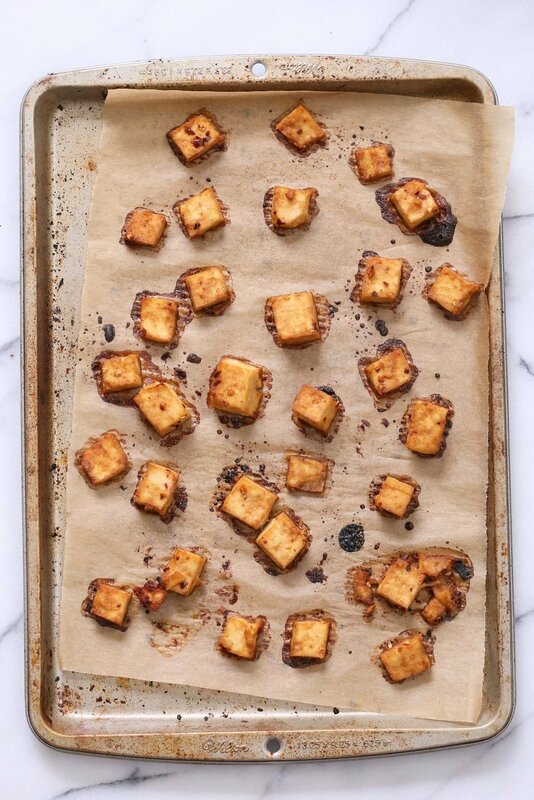 For crispier result, toss the marinated tofu in cornstarch or other starch and bake. 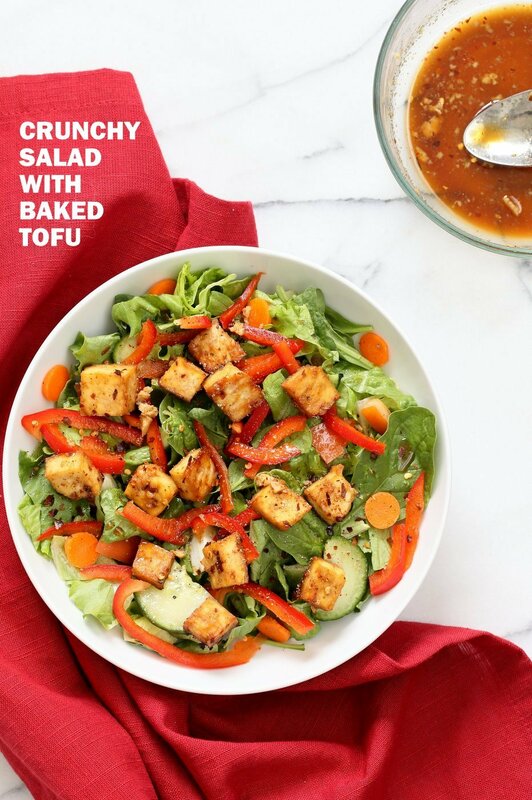 The dressing which is the same as the marinade, intensifies the baked tofu flavor and compliments juicy and crunchy veggies really well. Make a big bowl of this Salad for the next Summer Potluck or picnic. 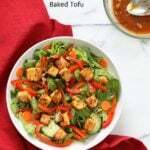 Or make wraps with the Baked Tofu, Veggies and finely chopped greens tossed in the dressing! Simple everyday ingredients and so much flavor. Whats your favorite everyday Quick Summer Salad? More Salad Bowl from the blog. If you make this Salad or a version of it, do leave a comment and rate the recipe. Tofu all baked and delicious. Assemble the salad with crunchy greens and veggies of choice. Toss in some tofu. Drizzle the dressing and some pepper flakes or black pepper. Preheat the oven to 400 degrees F / 200ºc. Mix the dressing ingredients in a bowl. Line a baking sheet with parchment paper. Press the tofu for atleast 5 minutes in a Tofu press or between paper towels. Cube the tofu and add to the bowl with the dressing. Let it sit for 5 minutes. Then strain the tofu out (slightly strained so there is some dressing but it isn't leaking the dressing everywhere), using a spoon or fork from the bowl and spread evenly on parchment lined sheet. Bake at 400 degrees f / 200ºc For 20 to 25 mins. Chop up the veggies and greens and arrange in serving bowls. Add some salt and pepper if using hearty greens or veggies and mix in. Add baked tofu. Thin the remaining dressing in the bowl with 1 tbsp of water and mix in. Dress each serving liberally with the dressing. Drizzle some soy sauce for additional dressing if needed. Add chopped scallions, cilantro or mint. Garnish with pepper flakes (optional). Serve. Make Quick Wraps: Use finely chopped lettuce or cabbage. Toss in a bowl with thinly sliced vegetables and the dressing. Place in wraps with the Tofu. Some juicy fruits such as oranges, apple or mango will work well in the wraps or salad. You outdid yourself…..again with this perfect recipe so very redolent of summer. Thank you for sharing ???? Hi Richa! Is there a substitute for sesame oil in the dressing? Thanks. I skipped the sesame oil and used sesame seeds. It was delicious. Thanks! This sounds absolutely yummy and satisfying, Richa! 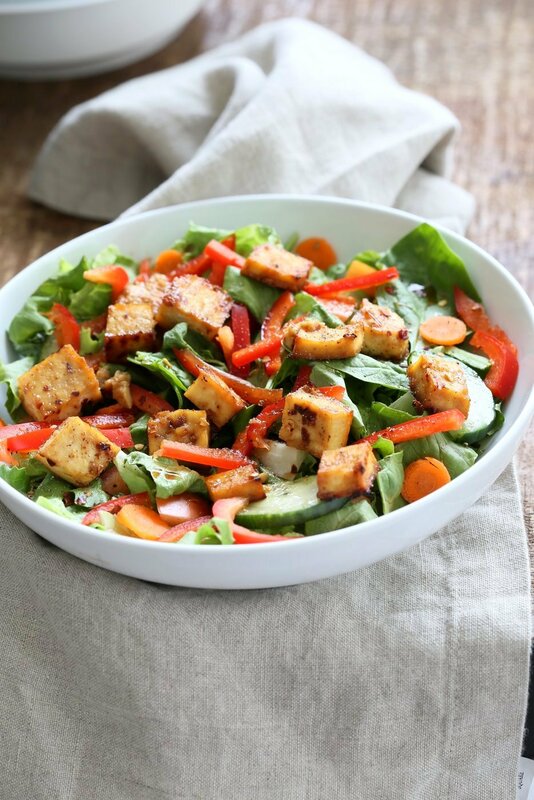 I bet the dressing and baked tofu would be good over steamed veggies, too! yes it might be. I have migraines too now. Triggers can vary from person to person. So try a tiny bit of soy sauce on a day the rest of the meals are migraine safe and see if you get symptoms. Made this tonight. Used cabbage instead of greens, added radishes, cooked brown rice, and tomatoes along with other veggies. It was great! Thanks for your wonderful recipes. It’s currently 35° here in France (95f) & so we definately didn’t feel like cooking. Richa to the rescue! We had this for lunch & added cooked & cooled rice noodles – yum! Excellent recipe & very versatile. Will be making again very soon. Thanks Richa! I was looking for tofu marinade and I decided to try your version of it. Thanks or the recipe! It was so good. You never disappoint on your recipes. I will be making this salad again soon. Thank you! Richa, this looks terrific and right up our alley. Will definitely make again and again. Thanks for another winning recipe. Wow, this looks so healthy and delicious! I’ve had a similar salad a week ago, and it tasted absolutely incredible! Made this tofu tonight and had it over some noodles and veggies. So good and super easy. I’ll make this again soon. I made this today and absolutely loved it! Thank you VeganRicha for your amazing recipes! Hi Richa! Any tips for making this ahead of time in a meal prep fashion for the week? How to store, will it last, etc?